In the past week, United Continental Holdings’ UAL subsidiary — United Airlines — expanded its partnership with Copa Holdings CPA and Avianca to strengthen its Latin American presence. On government’s approval, this customer-friendly joint business agreement (JBA) is anticipated to create more opportunities related to economic development. Delta Air Lines DAL also grabbed headlines by virtue of its tepid unit revenue outlook for the fourth quarter of 2018. The carrier now expects unit revenues to grow approximately 3.5% year over year in the October-December period. The previous outlook had projected fourth-quarter unit revenues to increase in the 3-5% band. Meanwhile, Ryanair Holdings RYAAY, which has been plagued by labor-related issues for quite some time, received encouraging tidings on the labor front. Notably, this European low-cost carrier reached a preliminary agreement with a union covering its German pilots to ink collective labor deals by early next year. 1. The proposed JBA between United Airlines, Copa Holdings and Avianca is anticipated to facilitate travel experience between the United States and 19 countries in Central and South America. The joint venture will allow U.S. passengers to enjoy a smooth connectivity to Latin America with new nonstop routes and ramped up services on the existing ones apart from reduced travel time. (Read more: United Continental Arm Inks Deal to Boost Latin American Base). 2. At Ryanair, November traffic (including 0.3 million from its LaudaMotion unit) rose 11% year over year to 10.4 million. However, load factor remained unaltered at 96%. Passenger growth, excluding traffic from LaudaMotion unit, was only 8% in the month. According to the traffic report, more than 88% of Ryanair’s flights arrived on time. Additionally, the deal with pilots has ensured that there will be no strikes in Germany at Ryanair. (Read more: Ryanair's November Traffic Rises Amid Low Airfares). 3. At Delta, November’s consolidated traffic — measured in revenue passenger miles (RPMs) — came in at 16.83 billion, up 4.2% year over year. Meanwhile, consolidated capacity (or available seat miles/ASMs) climbed 3.8% to 19.62 billion. Moreover, consolidated load factor or percentage of seats filled by passengers expanded 40 basis points (bps) to 85.8% as traffic growth exceeded capacity expansion. The carrier also recorded an on-time performance (mainline) of 83.2% and a completion factor (mainline) of 99.9%. Approximately, 15.5 million passengers boarded Delta in the month. For fourth-quarter 2018, the company anticipates earnings per share at the high-end of the guided range of $ 1.10 – $ 1.30. The Zacks Consensus Estimate for the same stands at $ 1.23. Revenues (excluding third party refinery sales) are now estimated to augment approximately 7.5% in the ongoing quarter. However, this projection is slightly lower than the previous view of an 8% increase. During the same period, Delta expects to generate higher pre-tax margins owing to dwindling oil prices and its measures to curb non-fuel costs. 4. At American Airlines Group AAL, the issue involving a 67-year-old woman, Olimpia Warsaw, took an ugly turn with the carrier contesting the claims of the elderly passenger’s family that she was left alone overnight at Chicago's O'Hare International Airport following the cancellation of her flight on Nov 30, 2018. After investigating the claims, American Airlines reportedly said that closed-circuit television footage of the event showed that the woman was alone for a little more than an hour after the Detroit-bound flight was cancelled. Per the footage, the lady used a walker twice to go outside to smoke during the time. 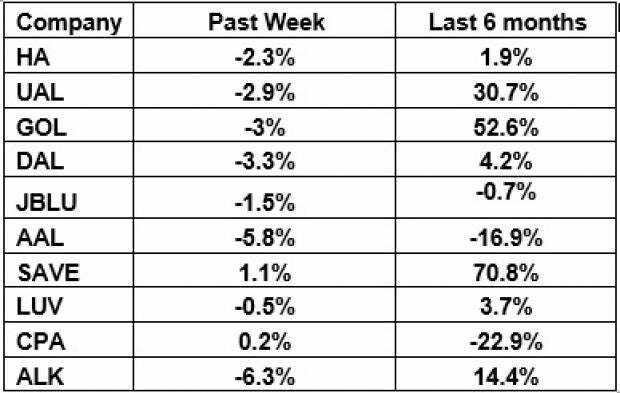 The table above shows that most airline stocks traded in the red in the past week leading to the NYSE ARCA Airline Index’s 1% decline. The sector tracker was hurt by Delta’s bearish fourth-quarter unit revenue guidance. Over the last six months, the NYSE ARCA Airline Index shed 0.6% of its value. Investors would look forward to November traffic reports from the likes of Southwest Airlines LUV and Hawaiian Holdings HA in the coming days. Ignited by new referendums and legislation, this industry is expected to blast from an already robust $ 6.7 billion to $ 20.2 billion in 2021. Early investors stand to make a killing, but you have to be ready to act and know just where to look.